The latest Lumix LX model has a range of new features including a larger, 17-MegaPixel sensor to tempt the semi-serious photographer. 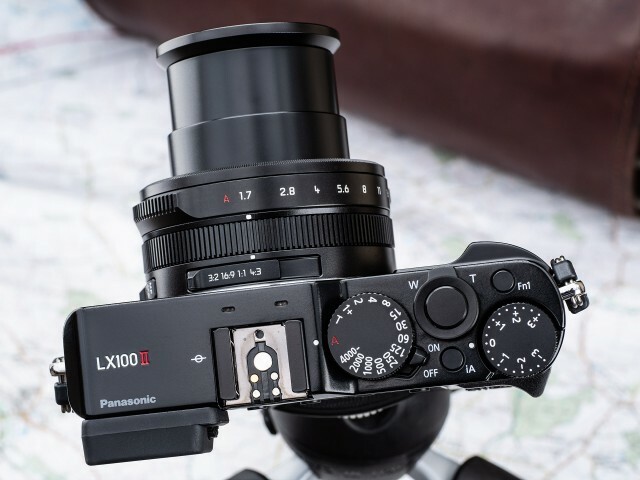 Launched as an addition to the current Panasonic range, the LX100 II is definitely not a replacement to the best-selling LX100, just a huge improvement on the current camera system. That, along with many new features to make the camera more user-friendly, add up to a system that will suit a whole range of photographers from the happy snapper to the semi-professional with the perfect shot in mind. There are many reasons why the new Lumix is an upgrade to the original LX100 rather than become an LX200 model, but also many new features that have mark the camera out as something more than just this year’s version of last year’s model. The standard lens on the camera is still the Leica DC Vario-Summilux 10.9-34mm f/1.7-2.8 ASPH, but it now positioned in front of a new 20MP four-thirds sensor. Obviously, in the train of elements that ultimately capture the image, the lens figures pretty highly and Panasonic got it right with the same lens when the original LX100 launched, so have gone with it again. Having the same tried and trusted system on the front of the LX100 II gives a nice warm feeling that this is going to be at least just as good. As it turns out, that lens is the front end to an image capture system that makes the LX100 II far superior to the previous model. To achieve the best resolution in a number of aspect ratios the 4:3 native image dimensions don’t employ the full width of the sensor so the LX100 II will never produce a 20MP image as we would with the some other cameras, but while the LX100 produced a 13-million-pixel image from what was effectively a 17-million-pixel sensor, this latest Lumix turns out 17MP images from a 21.7MP sensor in the 4:3 setting. The wider sensor also has another advantage too. Since it is wider than usually needed to create 4:3 ratio images at 17MP it allows higher pixel counts and these extra pixels ensure a high resolution no matter which ratio you choose to shoot in, picking from 4:3, 3:2, 1:1 and 16:9, which actually results in a drop of only 2MP across the range. The camera cleverly expands the width of the sensor area rather than cropping the height, so you are assured of a sharp image whatever the ratio chosen. The 1:1 ratio that is accessed via the ratio switch on the lens barrel uses the full available height of the sensor, but which doesn’t create a higher resolution image than would be expected by cropping square in post-production. While the Panasonic GX9 gives more resolution than the LX100 II in most instances, the thinking behind the new camera is that it results in a much smaller overall package, making it more convenient to carry and therefore desirable to many users. The LX100 II incorporates Panasonic’s Depth-From-Defocus (DFD) technology which significantly shortens the time to acquire focus on the subject, making it an ideal action camera. The camera can achieve a high-speed AF of approx. 0.10 second to capture those fast photo opportunities. This improvement achieves greater benefits as focal length increases. The camera boasts high speed burst shooting at 11 fps (AFS) / 5.5 (AFC) to capture fast moving subjects perfectly. The LX100 II also includes the Lumix Starlight AF system which allows users to shoot a low-light subject such as a star in the sky at night by effectively using auto focus. The system does this by accurate calculation of contrast value in a smaller AF zone, and the advanced Light Composition mode examines and saves the brightest pixels from a series of shots in-camera, to produce more dramatic images of night scenes. A Post Focus mode allows the user to choose the focal point of an image after the shot has been taken, while Focus Stacking combines focal points to achieve complete foreground to background focus. By comparison, in strong sunlight, the LX100 II is capable of releasing the mechanical shutter at max.1/4000 sec and 1/16000 with electronic shutter, which reduces washouts. The camera has retained the familiar manual exposure compensation dial seen on the LX100 but also, surprisingly, the inability to compensate by more than three stops. Fortunately, however, Panasonic have included the option to assign exposure compensation to a function button which then allows the user to extend the amount of compensation available to +/-5 stops. The LX100 II is capable of smooth, high quality video recording in true 4K (3840 x 2160, at 100mbps/25 fps in MP4). Furthermore, the LX100 II’s advanced 4K Photo function takes advantage of 4K video recording to allow the user to shoot at up to 30fps and extract the perfect moment as 8-megapixel stills directly within the camera. The camera also has an Auto-Marking function for shots, which enables fast access to the most appropriate frame and Sequence Composition, allowing the merging of various frames to create special effects. 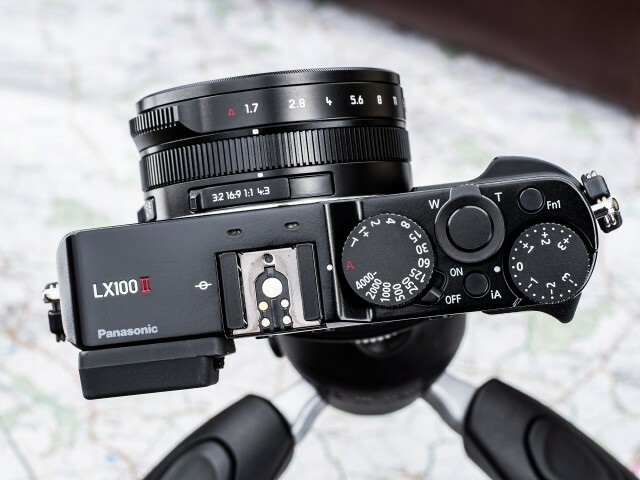 In line with other Panasonic products, the LX100 II has the usual three forms of 4K Photo with the auto marking function and bulk saving options, as well as Post Focus and Focus Stacking. There is also the newer Sequence Composition mode that was first seen on the Lumix GX9, which is now a feature of the G9 and GH5 models. 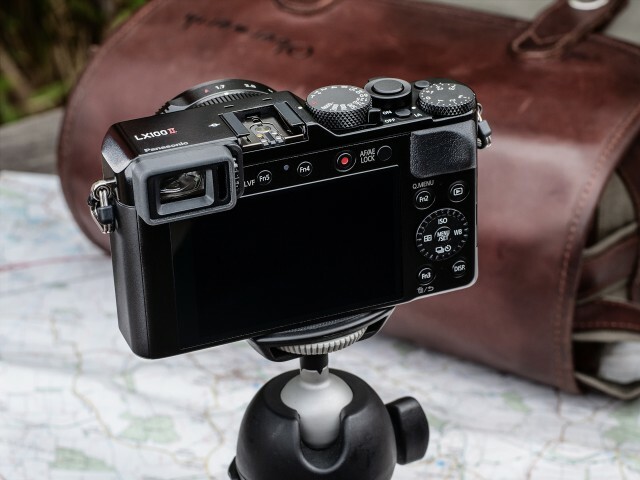 The LX100 II has plenty of new features in its interface to satisfy even fairly professional users. Along with a high-resolution (2764k-dot) Live View Finder, offering a 100% field of view and excellent magnification (0.7x, 35mm equivalent), there have also been huge improvements to the rear LCD screen. The new 3.0-inch touch-sensitive screen compliments the package and gives the user a huge degree of flexibility in the composition of images however you want to. The LX100 II also introduces a series of new Monochrome Photo Styles too which helps the user create dynamic black and white images with emphasized highlights and shadows, while preserving all the original shot details. Using this, the user can choose from an array of different grain strengths to add a film-like quality to monochrome images. Programable functions are becoming increasingly important to users and the LX100 II takes account of this. While the LX100 had only three programmable buttons this new version of the camera offers a whopping ten control points. There are five physical buttons in addition to five on-screen virtual buttons – and then there is the control ring on the lens as well. Each of the function buttons can be assigned to activate one of 54 functions within the camera, while the total available on the LX100 numbered only 40. While that is only really a marginal increase in functionality, it offers serious users the opportunity to customise until their heart’s content. The LX100 II adopts the new style of menu that was introduced with the G9 and is now found on many higher-end Lumix cameras. Overall, the look has a pleasing intuitive neatness and menu items are easier to find in the new system. The Bracketing Menu is a new feature in the menu for the LX100 II, and introduces focus bracketing as well as aperture bracketing, while also covering the existing WB bracketing and exposure bracketing. The LX100 II uses the same DMW-BLG10E battery as the LX100, so those owning the original model, as well as of the GX9, GX7, GX80 and other older models will already have spares batteries that slot straight in. The battery can be charged in a separate charger, as you’d expect, but also in-body via the USB socket. This is useful when traveling as the cable is one common with many smartphones, and universal power banks can be used to charge the camera when away from mains electricity making it ideal for a quick power boost while travelling, making the camera ready for use at any time. Communication with external devices can still be achieved by Wi-Fi, but the NFC found on the original LX100 is replaced by the more flexible Bluetooth option. This is a good step forward as Bluetooth allows a low-power connection to be maintained between the camera and a smartphone, and for the automatic transfer of images over Wi-Fi as they are recorded, extending image storage if away from home and web-storage options. In the Bluetooth mode, a smart phone can be used as a simple trigger for the shutter to get some great, well defined selfies. This is a very basic function and comes without all the other functions of the full Image App controls. The LX100 II appears to be an upgrade of the original camera, but the sum total of all the new elements included in the release makes it a natural progression for current LX100 owners, who will be assured of getting a familiar camera with a host of new features. With sharp image quality and a host of post-processing functions, this is a camera that will bring superb photography too many.